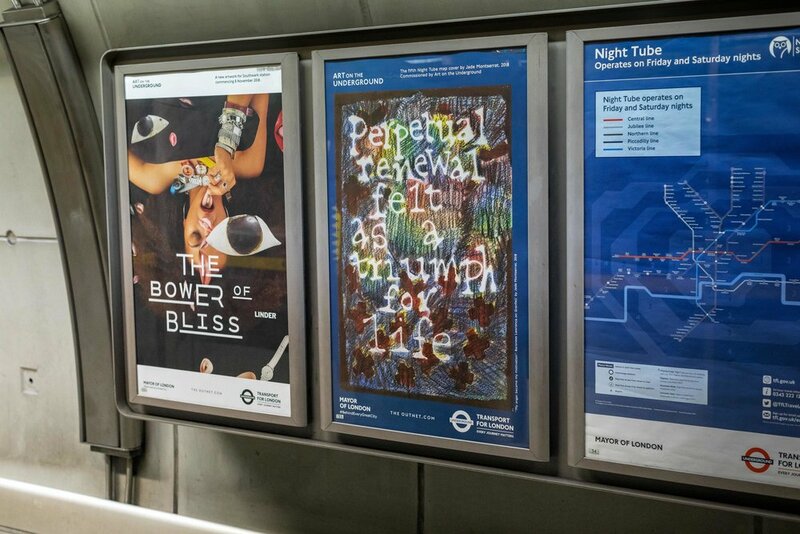 The text work forms one element of a three-part commission by Jade Montserrat for Art on the Underground – an annual programme established in 2000 which invites contemporary artists to create temporary and often topical interventions into the London Underground network, where they are encountered at stations, on billboards and on pocket maps. Montserrat’s commission is part a year-long programme focused on female artists which marks the centenary of women’s (partial) suffrage. 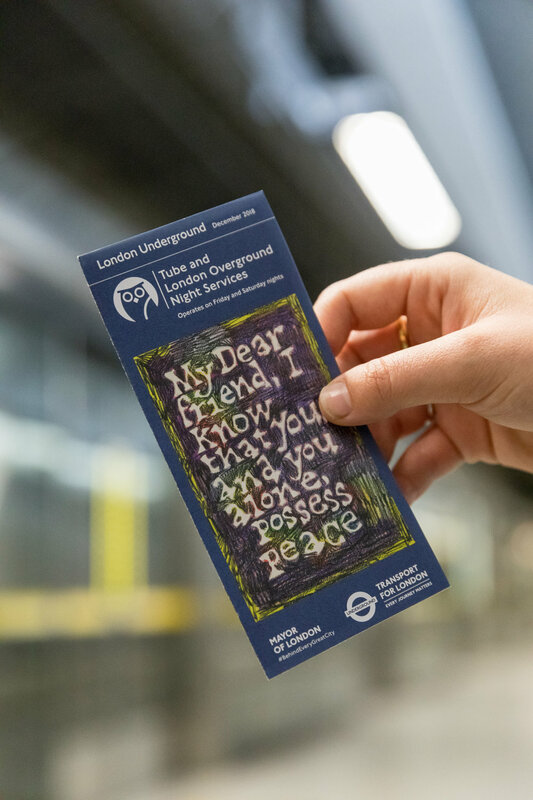 Her night tube map was launched alongside a pocket Tube map cover by the pioneering collage artist Linder Sterling. Montserrat is known for her drawings, paintings and performances, which bring together art and activism. Her recent exhibitions have taken the form of huge drawings at the Institute of Contemporary Art in Philadelphia and the Bluecoat in Liverpool (both 2018). Written directly onto the walls in charcoal in her naively awkward hand, observations around themes such as language, ownership, empowerment and transformation read like fragmented poetry or modern-day aphorisms. She is currently the Stuart Hall Foundation PhD candidate at the Institute for Black Atlantic Research at the University of Central Lancashire, where she is researching race and representation in northern Britain. Her work draws on sources as disparate as critical theory texts and graffitied slogans glimpsed from the train window. An important influence on Montserrat, which she remembers from her schooldays, was a series of wartime drawings of the London Underground by Henry Moore, another artist who spent his formative years in Yorkshire. Moore’s drawings depict a wearied, anonymous mass of Londoners, huddled together in Tube stations to shelter from the Blitz. In stark graphite, he captured the poverty and privations of the wartime experience – and the inadequacy of the government’s provisions to protect citizens from the bombing. “There were particular ideas, and certain words, names and events, that I really needed to make visible,” she explains. One of these was the Grenfell Tower Fire in June 2017. Montserrat finds herself unable to “divorce being in London with knowing Grenfell happened.” This tragedy, which took place in the wake of institutional indifference to concerns raised by social housing residents, is acknowledged in a poster entitled “My anger became my motivation”: Baroness Lawrence on Grenfell (2018). Installed across the Tube’s network of 270 stations, it celebrates a “strong woman leader” (Montserrat) who was outspoken following the disaster. All three of Montserrat’s works for Art on the Underground ask us to confront uncomfortable truths and open our eyes to the stories of those citizens who remain invisible. As part of her research for the commission, Montserrat spent time in Glasgow, where she found the city’s Women’s Library particularly inspirational. Among the material she looked at were archival documents and annotated photographs relating to the black women’s movement and the Camden Lesbian Centre. Beneath the layers of pencil in these works are the colours of the rainbow, hinting at optimism and renewal. For Montserrat, the rainbow is linked with peace – something she believes we all have a shared responsibility towards. She enjoys the play on words between ‘peace’ and the materiality of the piece of paper, which she asks us to pick up and carry with us as a reminder to act on it.